I was propped up in bed next to my husband. Me with book in hand, he with computer games blinking on his tablet. I took a sharp breath in, a reaction to the sentence that I was reading. “What? What?” he asked. I always hate it when he interrupts my reading with, “What are you reading?” or in this case, “What? What?” But this time I wanted to share what I read. “Do you mind if I read a bit of this to you? Can you listen while you play Auralux?” I asked trying to sell him on allowing me to read the words that, to me, described the Camino pilgrimage experience so well. I had just cracked open the recently-released English version of The Great Westward Walk: From the Front Door to the End of the Earth by Antxon Gonzalez Gabarain. I was only in the introduction and already mesmerized. ‘The Great Westward Walk’ is a true story. “The Walk to the End of the World” is a true story. It celebrates the fundamentally irrational nature of pilgrimage, as it plays out against the banal rationality of our times. Yes, the dichotomy of pilgrimage in these times when rationalism is often valued over spirituality struck a chord with me. I finished reading out loud the introduction, written by Izaskun Gonzalez Gabarain, and then resumed my silent reading. Another gasp. Another “What? What?” and I began reading the Prologue written by another of the author’s friends to my husband. This time without hubby’s permission. He told me he was dying. He was finishing the book using a special computerized device that allowed him to type by tracing the movement and blinking of his eyes. A terrible, consuming disease had taken away use of his hands, arms and legs…Antxon was running out of time. Finishing this book was his final desire, he said, his last wish. The writer completed the manuscript, a captivating memoir of his Camino journey from the doorstep of his home in Zumaia, in the Basque Country, to Santiago, three days before ALS took his life at age 41. Yet Gabarain lives on in this book that gives me insight into his Basque ponderings and connections with his countrymen that I, as a foreigner, could never have. His words, almost poetic at times, roll back the curtain on slices of Spanish life that I would not otherwise have known. His insight and description are probably reasons that the Spanish version is a best-seller in Spain. 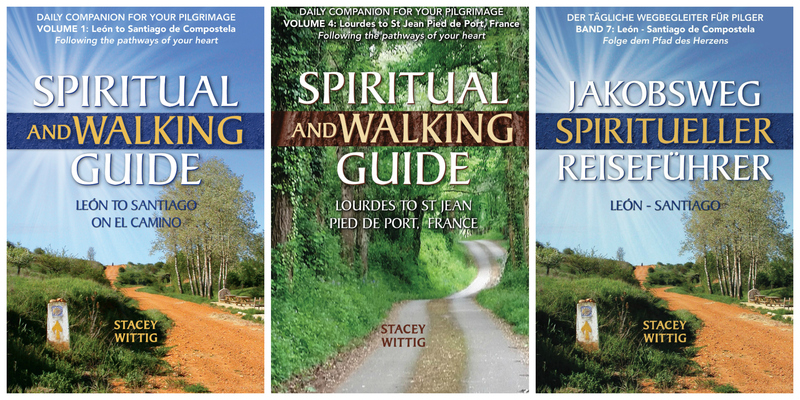 Three cheers to Rebekah Scott, American Pilgrims on Camino (APOC) member and speaker at the 2017 APOC gathering in Atlanta, for her fine work of translating this amazing Camino narrative. This review originally appeared in the September 2017 edition of La Concha, the quarterly publication of American Pilgrims on the Camino.